Have you ever had a smartphone slow down before? You think “I thought my phone wasn’t like my computer at all”. There are many reasons to why this happens, but the most common is that storage is pushed to the brink. Just like on your PC, when you don’t clean your cache history on your web browser or even apps, things tend to slow down. History Eraser can change all that. History Eraser is an app made by app developer INFOLIFE LLC, and it makes speeding up your phone a breeze. History Eraser comes in two versions like most apps: free and a paid version. The ad free version is $0.99, while the free version comes with some unsightly ads You can clear your anything from app cache, call logs, and messages. Instead of going from call logs, messages, and then to every app, and deleting things manually, you have a hub in which to control your storage. With the easy interface, you can see how much storage is currently available, and the total space on your hard drive. 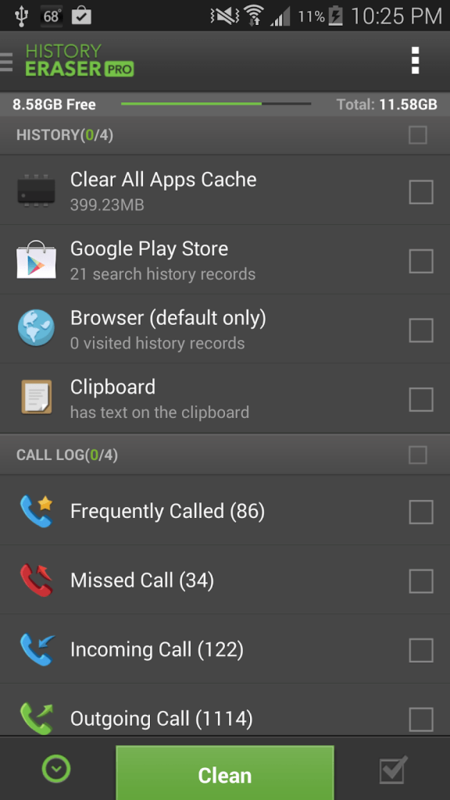 Along with viewing storage statistics, it tells you how much app cache that can be cleared, how many calls in your call log, and how many incoming and outgoing text messages you have. For people who like to customize their app settings, there are multiple things you can do with History Eraser. Setting what you want to clean is simple by either checking or unchecking certain things you wish or do not want to clear, such as incoming or outgoing calls, missed calls, frequently called, sent and received texts, and even text drafts. You can also schedule an auto clear interval, which ranges from one hour, to three days, and even to clear memory when your screen turns off. To go along with this convenience, you can also put the app widget on your homescreen and clear memory with one click. If you are someone who is always on the go, and don’t have the time to manually go through your phone to remove unwanted data, History Eraser is the app for you. It brings convenience and practicality to your phone and can gain back lost performance. Whether your phone has the dreaded age symptom or you just want to keep your current smartphones performance up to par, give History Eraser a try. You can find History Eraser on the Play Store here.